The treatment of cancer is a conflicting and complex process; the drugs that are used to kill cancer cells are also toxic to your healthy tissues. However, the different physiology of tumors provides a route to deliver drugs safer and more effectively through the use of custom made drug carriers. Stimuli responsive nanomaterials have emerged as programmable delivery systems for anticancer drugs, in order to free them from their cytotoxic limitations. Stimuli responsive materials can be externally activated or passively self-triggered. We focus on the latter, which exploits the abnormal tissues of diseases such as tumors, where tissues have leaky blood vessels, the over-production of certain bio-markers, increased temperature and acidic local extracellular pH in the tumor environment; all factors that can be exploited to trigger the release of drugs. In this study, we target the average lower pH of tumors compared with normal tissues for the selective release of anticancer drugs. Fig. 1. By simulating the lower pH in cancer tumors, we are able to change the shape of the lipid molecule due to the protonation of the amine group on the polar ‘head’ of the molecule. 2. This results in a change in nanostructure of the drug delivery matrix from H2 (slow releasing) to v2 (fast releasing) as shown by small angle X-ray scattering. 3A. As a consequence, more anti-cancer drug, Doxorubicin, is released from the gel in the cancerous conditions (pH 5.5) as opposed to healthy conditions (pH 7.4). 3B. This results in increased human colon cancer cell death at pH 5.5 (tumor conditions) compared to pH 7.4 (healthy conditions). Lyotropic liquid crystals provide the perfect nanostructured matrix for triggerable drug delivery. These systems consist of amphiphilic lipid molecules which self-assemble in aqueous environments to form gels with complex three dimensional nanostructures, which are able to control the release of drugs of varying properties and sizes. The geometry and symmetry of these structures determine the rate of drug release which can be precisely modified by the control of molecular self-assembly. This is controlled through the manipulation of lipid shape and consequently lipid packing, achieved by changing environmental factors such as pH. The most advantageous structures that are formed are the bicontinuous cubic (v2) and the inverse hexagonal phase (H2). Envisage v2 as two nanosized water tubes that never meet, twisted into a 3D pattern; drug is released quickly from this nanostructure. Think of H2 as long, closed nanotubes arranged in a hexagonal pattern; drug is released slowly from this nanostructure. We have developed a pH-responsive nanostructured gel which shows promise as a drug delivery system in the battle to defeat cancer. The system was made pH responsive by the addition of a small amount of a newly synthetized weak base, pyridin-4-ylmethyl-linoleate (PML), to a neutral lipid, monolinolein. The amphiphilic PML was designed expressly to ionize where it could manipulate the nanostructure of the gel upon protonation of the head group of PML in response to a change in pH at low concentrations (Fig. P1). At normal pH, the PML is neutral where it promotes the formation of the closed H2 nanostructure. Its ionization at low pH (≤ 5.5) results in the expansion of the head of the molecule, leading to the switch to the open v2 nanostructure (Fig. P2). The different intrinsic transport rates of v2 and H2 were explored at two different pHs simulating cancerous and healthy conditions (pH 5.5 and 7.4). The release rate of the anti-cancer drug, doxorubicin, from within the gel was ten times faster in cancer conditions than normal tissues (Fig. P3A). This feature was then utilized in cell culture studies using human colon cancer cells (Figure P3B). The cancer cells remain viable in the presence of the gel, and more importantly, three times more cells survive at pH 7.4 when the nanostructure is H2 than when switched to v2 at pH 5.5 due to the pH-induced switch (red rectangle in Fig. 3B). 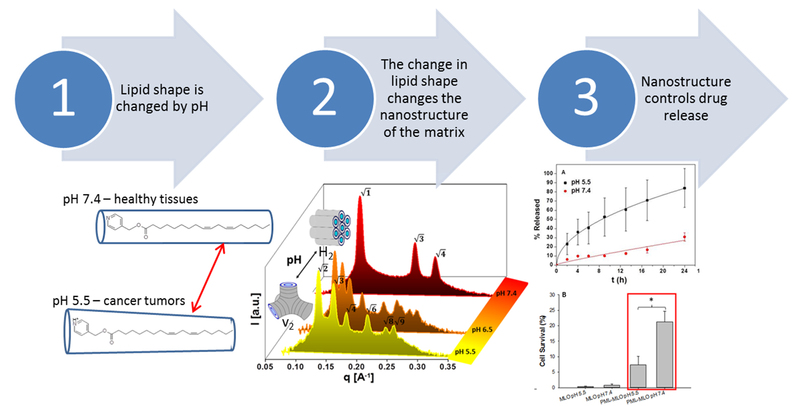 Thus, this study demonstrates that lipid-based lyotropic liquid crystalline matrices can be engineered to change their symmetry in response to a change in pH from 7.4 to 5.5, enabling a pH-controlled release behavior of doxorubicin. From a conceptual standpoint, these specifically designed pH-responsive gels can serve as tumor-targeted delivery systems by exploiting the most acidic conditions encountered in tumor tissues. This method of drug delivery has the potential to take modern cancer chemotherapies to the next level. pH-responsive lyotropic liquid crystals and their potential therapeutic role in cancer treatment.